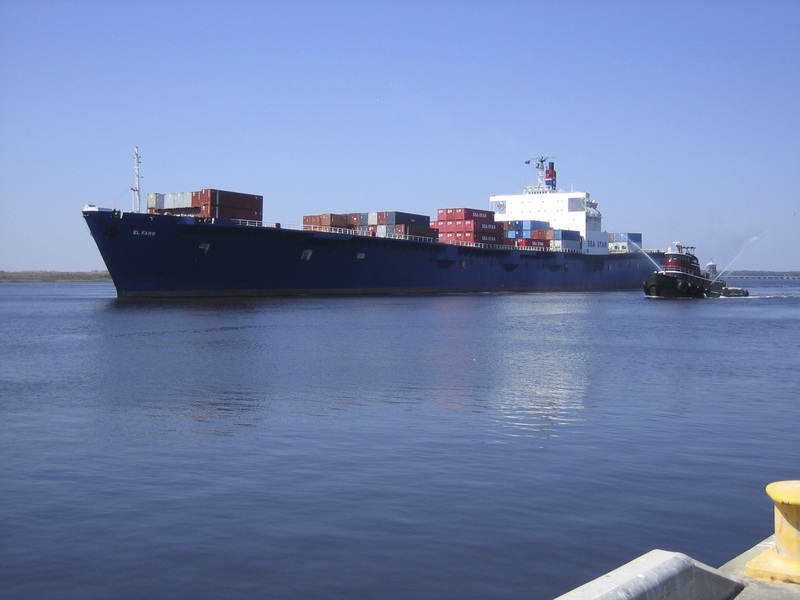 JACKSONVILLE, Fla. — About ten hours of transcribed audio from the doomed freighter ship El Faro was released by the National Transportation Safety Board Tuesday. Crew members aboard the doomed cargo ship expressed increasingly dire concern - occasionally tinged with gallows humor - as a hurricane gained strength, culminating in one crewman lamenting “I’m a goner” as they scrambled to abandon the listing ship, transcripts released Tuesday show. The transcript, which is more than 500 pages long, is the longest ever produced by the NTSB, reports CBS Baltimore. “The NTSB’s El Faro docket does not provide analysis, findings, recommendations or probable cause, no conclusions should be drawn from it,” the board said in a statement Tuesday morning. The El Faro bridge audio recording began about 5:37 a.m. Sept 30, 2015, roughly 8 hours after ship left Jacksonville, Florida. It ended around 7:40 a.m. Oct. 1. Audio recovered last summer from the ship’s resting place 15,000 feet deep near the Bahamas recorded conversations on the ship’s bridge, along with weather and positioning data. “Nobody in their right mind would be drivin’ into it,” one crew member said of the hurricane, the afternoon before the ship sank. “We are. Yaaay,” second mate Danielle Randolph responded with a sarcastic laugh. Instead of rerouting or returning to Jacksonville, Capt. Michael Davidson decided to watch the storm closely through the night. He thought the storm would be worse on the journey back to Jacksonville from Puerto Rico and emailed officials at the company that owned the ship, Tote Maritime Inc., to ask if he could take what he thought would be a safer route on that return trip. Davidson said he hadn’t heard back. “It’s 160 more miles. That’s more fuel. You know?” he replied. Eventually, a Tote official did respond “authorized.” U.S. Coast Guard investigators have raised questions about whether Davidson was under time pressure and chose the more dangerous, direct route. Davidson’s wife, Theresa, has said he was safety-conscious, getting in trouble with a different company when he refused to take out a ship that had steering problems. In a statement to The Associated Press, Tote denied having any say over Davidson’s voyage planning, saying it was up to him. “Our crews are trained to deal with unfolding weather situations and are prepared to respond to emerging situations while at sea,” the company said. Back on the ship, Davidson left the bridge around 8 p.m. to get some rest, telling his crew to monitor the weather. As the night progressed, some crew questioned why Davidson didn’t take a safer, longer route to San Juan - the same route it took during Tropical Storm Erika a month earlier. “Guess I’m just turnin’ into a Chicken Little, but I have a feeling like something bad is gonna happen,” third mate Jeremie Riehm said while on watch at about 10:40 p.m.
As the clock ticked past midnight, the crew steering the ship started discussing their survival suits and whether their emergency beacons were working. Then, a news alert came over the radio: Joaquin had grown into a major Category 3 storm. The 790-foot freighter sank in October 2015 during Hurricane Joaquin after losing propulsion between Jacksonville, Florida, and Puerto Rico. All 33 people on board died. Search crews hauled up the ship’s recorder last summer from the vessel’s final resting place some 15,000 feet beneath the sea. Within the transcript are conversations captured by six different microphones on the bridge deck of the ship. The ship was 22 nautical miles from the hurricane’s center when it sank at 7:40 a.m. The captain may have had weather data that was six hours old when he ordered a course correction south to avoid the eye of the storm. CBS Jacksonville affiliate WJAX reports other crew members expressed concerns about weather data in the ship’s final moments. The recorder captured loud sounds of banging and crashing that may have been containers breaking loose. When the ship lost propulsion, it was not possible to point the bow into the storm’s waves, leaving it at their mercy. The last voices heard on the recorder are believed to be the captain’s and a helmsman. Some of the conversations transcribed by the NTSB are chilling, especially near the end of the transcript, which shows conversations from right before the ship went down. The exact cause of the sinking is still to be determined by the NTSB.